How to use a VLOOKUP formula to get data from an Excel list. Troubleshoot VLOOKUP when things go wrong. 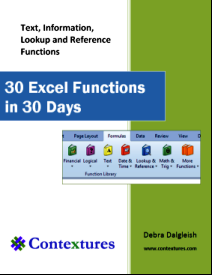 Step-by-step videos and free workbooks with VLOOKUP examples. Watch the steps for creating a VLOOKUP formula in the Product Price lookup video, show below. The written instructions are below the video. Get the Product Price Lookup sample file to follow along with the video (download file #4). It's a good idea to store each lookup table on a separate worksheet in the workbook. Then, as you add and delete rows in the lookup tables, you won't accidentally add or delete rows in any other table. In this example, the lookup table is on a sheet named Products. Lookup formulas can work vertically, looking for values down a column, or they can work horizontally, looking for values across a row. In this example, the information will be stored vertically, with values down a column, and later we'll use a VLookup formula to do a vertical lookup. The first column should contain the unique key values on which you will base the lookup. In this example, you can find the price for a specific product code. If you have other data on the worksheet, leave at least one blank row at the bottom of the table, and one blank column at the right of the table, to separate the lookup table from the other data. lookup_value: What value do you want to look up? In this example, the product code is in cell A7, and you want to find its product name. table_array: Where is the lookup table? If you use an absolute reference ($A$2:$C$5), instead of a relative reference (A2:C5), it will be easier to copy to formula to other cells. Or, name the lookup table, and refer to it by name. col_index_num: Which column has the value you want returned? In this example, the product names are in the second column of the lookup table. [range_lookup]: Do you want an exact match? Is an approximate match okay? Once you have created the lookup table, you can create other formulas in the workbook, and pull information from the product list. For example, to prepare an invoice, you can enter a product code, and formulas will get the product name or price from the product table. In this example, the invoice is created on a sheet named Invoice. The VLOOKUP formula should find an exact match for the product code, and return the product name. Click on cell A7 to enter its reference. Type a comma to end the second argument. Type a 2, which is the column in the lookup table that contains the Product name. Type a comma to end the third argument. Type FALSE, to specify that an exact match for the product code is found, and add the closing bracket. Press the Enter key to complete the formula. The product name will be displayed. In some situations, an approximate match is preferred, so several values will return the same result. For example, when grading student papers, all papers with a grade of 85 or over should receive an A grade. To view the steps for creating this formula, please watch the VLOOKUP video shown below. The written instructions are below the video. 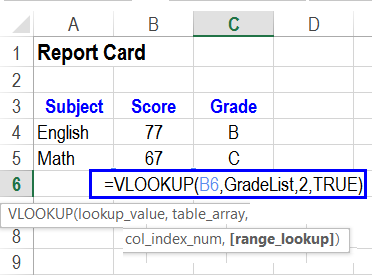 In this example, the lookup table is created on a sheet named Grades. 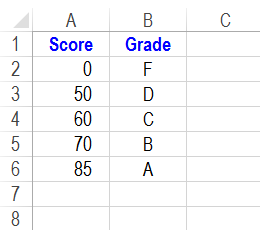 To create the lookup table, enter the minimum score for each grade in column A. Enter the matching Grade in column B. Sort the Scores in Ascending order. Cells A2:B6 were named GradeList. On the Report Card sheet, in cell B4, enter the score 77. In the screen shot below, the formula has been copied down to row 6, and the you can see the formula in cell C6. Makes the formula flexible, so it's easier to copy the formula across a worksheet. Can prevent problems if new columns are added in the lookup table, or if the lookup columns are rearranged. This video shows the steps, and there are written instructions for another example, below the video. In this example, a VLOOKUP formula will return the order details from a lookup table, based on the order ID number. Here is the lookup table, named tblOrders. NOTE: This example is in Sample Workbook #1, on the sheet named OrdersMATCH. Here is the worksheet with the VLOOKUP formulas. We want the Region, Order Date and Order Amount for each order, so 3 VLOOKUP formulas are needed. Instead of typing the column number in the VLOOKUP formula, we can use the MATCH function. The MATCH function finds the position of an item in a list, and returns the position number. In the screen shot below, the MATCH formula returns 2 as the position of "Region", in the heading cells (A1:D1) for the lookup table. NOTE: For this technique to work correctly, the headings on the VLOOKUP sheet must match the lookup table headings exactly. To ensure an exact match, the VLOOKUP heading cells are linked to the lookup table heading cells. Now, instead of needing a different formula in each column, you can copy the formula across, and use the same formula in all the columns. In each column, it will refer to the heading cell in that column, and find its position in the lookup table. You can use an IF formula with a VLookup formula, to return exact values if found, and an empty string if not found. To see the steps for setting up the IF and VLOOKUP formula, you can watch this short video. The written instructions are below the video. On the Invoice sheet, in cell A8, enter the product code A28. 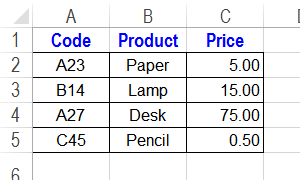 If the VLookup formula in cell B8 has FALSE as the fourth argument, the result is #N/A, because there is no exact match for the product code in the lookup table. Press the Enter key, and cell appears blank. Because no exact match was found, the VLookup formula returned an #N/A, so the ISNA function result is TRUE. The IF formula converted this to an empty string. Thanks to Chip Pearson for suggesting this formula. 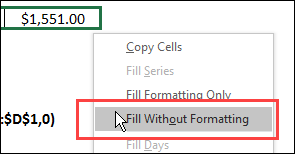 In Excel 2007, a new function, IFERROR, was introduced. You could use an IFERROR formula with VLookup to check several tables for a value, and return the related information when found. In this example, three regions, West, East and Central, have order sheets. On each sheet is a named range -- OrdersW, OrdersE and OrdersC. On a sheet named Orders, you can enter an Order ID, then use a VLOOKUP with IFERROR to check each named range, and view the information about the selected order. On the Order sheet, in cell B6, enter a 4 as the OrderID. That order was placed in the Central region. 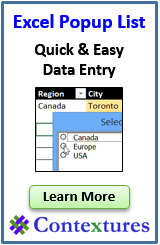 Press the Enter key, and the VLOOKUP formula returns an #N/A, because Order ID 4 is not in the East regions order table. 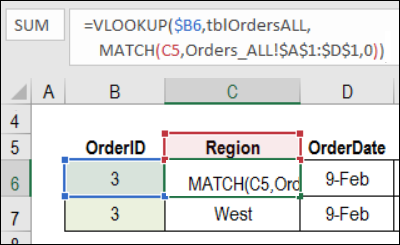 Because an order could have been placed in any of the three regions, you need a formula that will check each table. 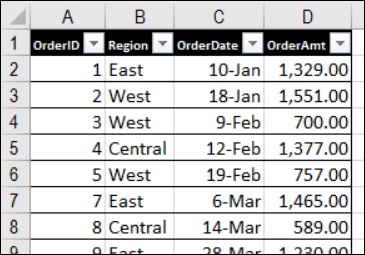 If the order ID is not found in the first table, the formula should check second table. If the order ID is not in the second table, it should check the third table. If the order ID isn't in the third table, then a "Not Found" message should appear in the cell. This checks the OrdersE table and if an error is found, checks OrdersW table, then OrdersC. If the OrderID is not found in any of the three tables, the Not Found message is shown in the cell. In some tables, there might not be unique values any column in the lookup table. For example, in the table shown below, Jacket is listed twice in column A. However, there is only one record for each jacket and size combination -- Jacket Medium in row 4 and Jacket Large in row 5. If you need to find the price for a large jacket, a VLOOKUP based only on column A would return the price for the first jacket listed (Medium). You would be underpricing the jacket -- selling it for 60.00, instead of 65.00. 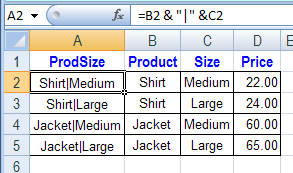 To create unique lookup values, you can insert a new column at the left side of the table, and use a formula to combine the product and size. In cell A2, the formula combines the value in B2 and the pipe character and the value in C2. Copy that formula down to the last row of data, so each row has a unique value in column A. Note: Instead of the pipe character, you could use another character that isn't included in your data. Then, in a VLOOKUP formula, combine the product and size as the Lookup_value. In cell H1, the formula combines the value in F1 and the pipe character and the value in G1. A common cause for this error is that one of the values is a number, and the other is text. For example, the lookup table may contain '123 (text), and the value to look up is 123 (a number). The double unary (--) converts text to a number, and will work correctly even if the lookup values are numbers. The TEXT function converts a number to text, and will work correctly even if the lookup values are text. In the first example, the & operator creates a text string from an unformatted number. In the second example, a number formatted with leading zeros (e.g. 00123) would match a text "number" with leading zeros. To see the steps for fixing the VLOOKUP problem when the lookup table has text values, watch this short video tutorial. Another potential cause for no matching value being found is a difference in spaces. One of the values may contain leading spaces (or trailing, or embedded spaces), and the other doesn't. To test the values, you can use the LEN function, to check the length of each value. For example: =LEN(A7) will return the number of characters in cell A7. 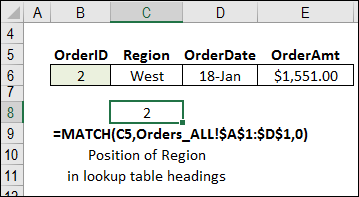 It should be equal to the number of characters in the matching cell in the lookup table. NOTE: This problem can occur with other functions too, such as an INDEX/MATCH lookup formula. Watch this video to see the steps for fixing the problem, and download the VLOOKUP Sorting problem sample file to follow along. The written instructions are below the video. This type of reference is created if you click on another sheet while building the formula. 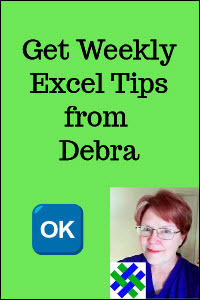 As soon as you do that, Excel adds the sheet name to any subsequent references in the formula. In the screen shot above, Dress is in cell B9, and cell C9 shows the correct price of $30. After the unnecessary sheet names are removed, the list can be safely sorted, and the correct results will show for each item. 1. 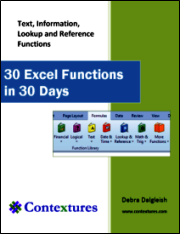 Get the VLOOKUP sample workbook (Excel 2007 and later). The zipped file is in xlsx format, and does not contain any macros. 2. For Excel 2003, get this version of the VLOOKUP sample file. The zipped file is in xls format, and does not contain any macros. 3. To see the problem that can occur when sorting with VLOOKUP, get this VLOOKUP Sorting problem sample file. The zipped file is in xlsx format, and does not contain any macros.